Posted on May 26, 2015 June 11, 2015 by Mark R.
The site has been there since at least 2007. G5ED-Y is in the amber cytoserocin hotspot. I think it’s gonna turn out to be more about blue pill than about drifters. So it looks like while it’s certainly interesting, it likely does not play a role in the recent Drifter phenomenon. Regardless, I’m still very curious about the associated missions and may just have to try improving my status with the Caldari State. This is a corollary to my previous post outlining my recent exploration in G5DE-Y. The Taibu State remain a mystery to me so I wanted to provide some up-close-and-personal imagery in an effort to better document my findings. 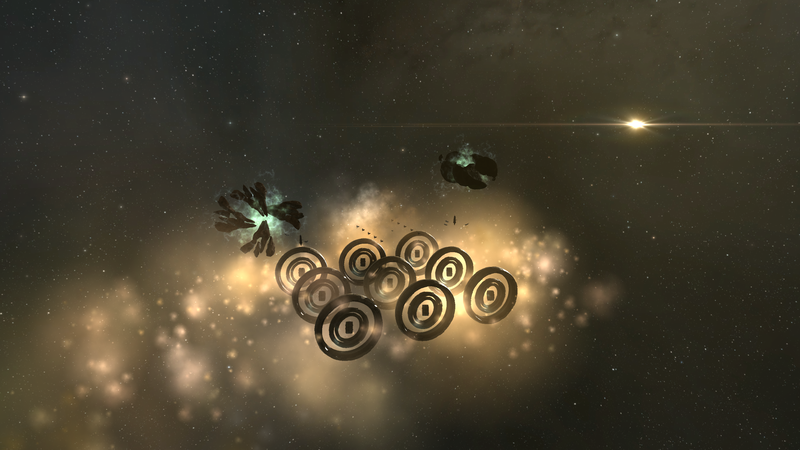 As stated in my last post, Chasing the Ghost of Hilen Tukoss: Mysteries of G5ED-Y, there is an NPC operating under the name Taibu State that has amassed what a formidable garrison in the G5ED-Y system. The garrison appears to have some connection to the Caldari Navy and appears to be employing a number of Caldari ships under new faction names. With regards to the location’s strategic importance, this isn’t a particularly extraordinary system when it comes to resources, but it is right on the Jovian border. Whatever is going on here has also captured the attention of the Guristas who have about a dozen cosmic signatures dotting the system. The Taibu garrison is operating under the name “Contested Kois City” and is based around a large “Giant Snake-Shaped Asteroid” which towers above a well-guarded acceleration gate labeled “Gate to Defense Perimeter“. Incidentally the Kois City moniker is a reference to an Admiral Kois who is overseeing the Taibu forces based here. Taibu State Shukuro Daijo patrolling Contested Kois City. 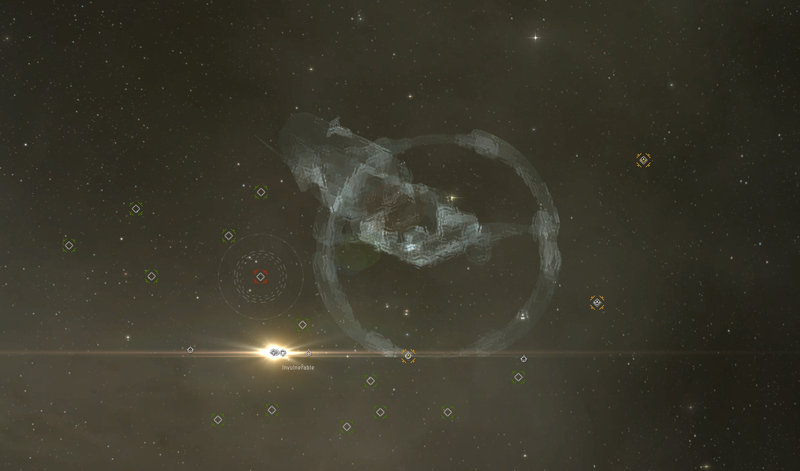 The gate is flanked by two well patrolled Caldari State Lookout Towers. It seems like it would be foolhardy to approach the garrison alone in my trusty Stratios, Urocyon, with so much red on the overview so I’m not certain that they would react aggressively to approaching capsuleers…just don’t want to chance it at the moment. That being said, I should mention that on my second jaunt to the installation this evening, an agent by the name of Oronata Vio piloting a Caracal appeared near the asteroid. She popped-up when I got (cloaked) within about 70km of the installation so presumably capsuleers can approach her for missions. Minedrill traces its history back to the war with the Federation, to a special force unit within the Caldari Navy that rigged asteroids with explosives and used them as booby traps. After the war the personnel in the unit created Minedrill and used their special knowledge to quickly gain prominence within the mining industry. The stated links to Caldary Navy special forces and explosives expertise adds more to the mystery and increases the already high probability that this operation is a big deal to the Caldari. The emphasis on explosives so close to Caroline’s Star also piques my interest. Unfortunately, I lack the necessary standings to start a conversation with Oronata so if anyone reading this happens to be able to talk to her, please let me know what she says! Given that Mordu’s Legion was touted as having a possible link to the Drifter Batteships, I can’t help but wonder if there’s some sort of “design love triangle” going on here. I’ll continue to probe the installation and let you know what I find. In the meantime, please feel free to comment below or get in touch via Twitter @marksuvulpine if you have any information on this activity. Taibu State Wakizashi patrolling The acceleration gate at Contested Kois City. Also worth mentioning is a location in the system entitled “First Sergeant Hakiro’s Lookout” which features an eponymous agent. The lookout is clustered around a “Particle Acceleration Superstructure” described as being a useless remnant of a much larger machine. There are also an abundance of Taibu vessels, yet these appear grey on the overview instead of red and are of the “COSMOS Caldari Non-Pirate” Type. Unfortunately, I lack the standings necessary to chat with the Sergeant so again…left with more questions than answers.